Something strange always happens to me in June, I lose the will to knit. Why June? Well I think it's something to do with it being the middle of the Southern Hemispheres winter. I knit when I'm happy and I'm really not happy when I'm cold. Not knitting makes me feel very unproductive. The rest of the year if I'm sitting, I'm knitting but not June. In June, if I'm sitting, I'm sitting. Over the next few days I hope to show you what I have been up to. 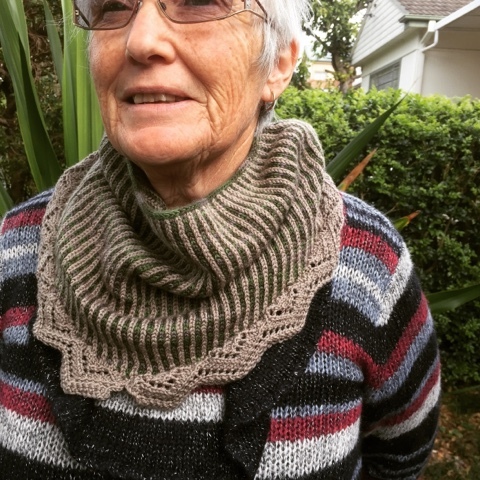 Today's project is the Wild West Cowl, modelled below by my wonderful Mother (she was horrified by this photo because she thinks she looks like her mother. She's right, but as I loved Nanna dearly I think it's kind of wonderful). This was a test knit run through Ravelry. The designer was seeking experienced knitters who have never worked with brioche stitch and would be willing to give the pattern a go. I had been meaning to give brioche a go for a while but had never taken the leap. The pattern has now been released and can be found here Wild West Cowl. My project is here Loudoh'S Wild West Scowl. It was a great scrap project as I used less than 50g of each of the two yarns and the cowl would make a great gift. I love the effect of brioche, but you know me I'd like it in a very simple style of thing, just a straightforward loop neck cowl, no decorative edging. Didn't I put something similar in that neon and neutrals post? I could go a bright floor if it was set against off white or the palest grey. I guess I should put it on my list of possible projects. By the way, such a good plan to get you through your winter slump, I hope you knit in the sun sometimes, that might help your stumpiness too? I'm happiest when it's cold, my brain slows down to a sludge crawl when it's hot, and I have no motivation when I'm sweating. I knit when its 35c outside because I am very strange. I do knit in the Sun but as most of my knitting time is in the evening I tend to stay in my nice warm living room and grumble about how cold the rest of the house is...I grumble a lot in Winter, except of course if its snowing and then you will find me skiing. I'm all or nothing. Bright floor, good one spell check. Bright FLURO!